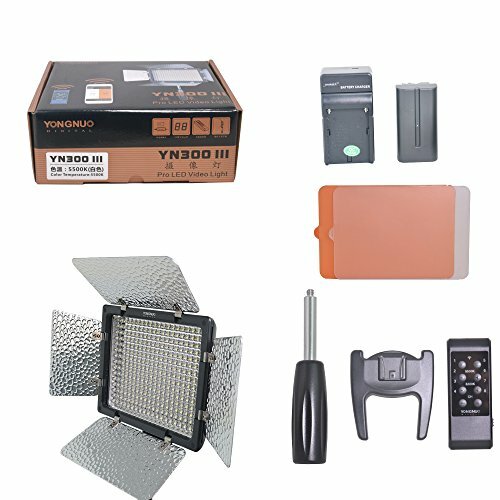 Moreover it effectively improve the conversion efficiency,adopts the encoder digital dimming mode, thus the camera light can be dimmed accurately and reliable, and will not lead to undesirable effects such as light shaking after long-time use, adopts LED digital display screen that allow you to view the current operating state, besides, the camera light is equipped with powerful functions such as power test, wireless remote control the groups to adjust the brightness. Size: 173*153*43 Compatible Batteries: Sony NP-F series, NP-F750, NP-F550, NP-F950/B, NP-F530, NP-F970, NP-F970/B, NP-F570, NP-F770, NP-F960, NP-F930, NP-F930/B, NP-F950, NP-F330 Compatibility: Almost all the SLR cameras camcorders,like Canon Nikon Pentax Olympus Samsung Panasonic JVC and so on.Except Sony&Minolta(It needs hot shoe adaptor to use the LED light). ; 2 x CT .
HIGH BRIGHTNESS. YN300 III adopts 300 high-quality LED light beads of extra-large luminous chips,the brightness is higher,the light spot is more evenly and the service life is longer. DIIMMABLE and RECHARGEABLE, the brightness of this video light is 0-100% stepless adjustable, the battery is rechargable. NP-F550 2200mAh battery included and 1 year warranty offered. We are also offering power adapter separately, contact us if need.